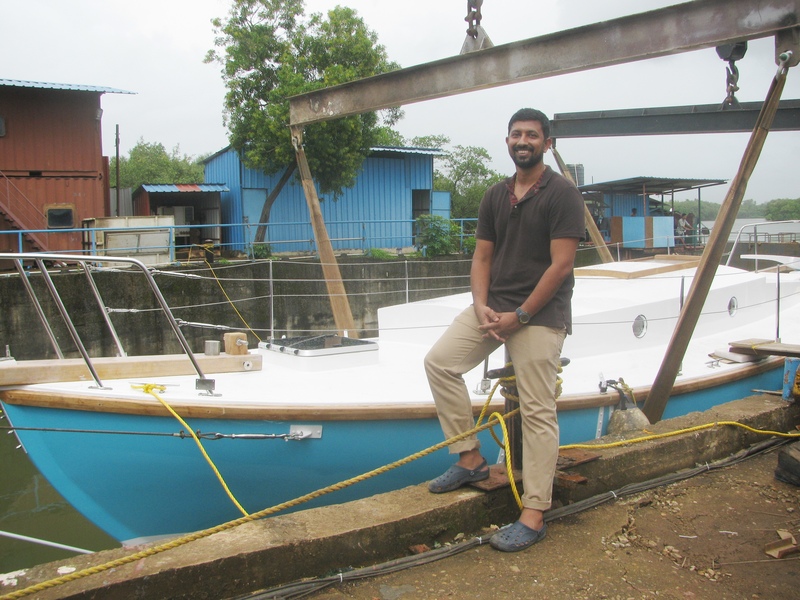 Commander Abhilash Tomy KC, the first Indian to do a solo nonstop circumnavigation in a sail boat, gets ready to do another solo nonstop circumnavigation in his new boat, the Thuriya. Nearly fifty years ago, in 1968, the first Golden Globe Race (GGR) had produced the first man to complete a solo nonstop circumnavigation of the planet in a sail boat. That person – Sir Robin Knox Johnston – was also the only participant to finish the race. His boat, the Suhaili, was made of wood and built in Mumbai. The last time I used a typewriter to author an article was way back in the early 1990s. Ever since, it has been the computer. And for the last several years, a computer with Internet connection, making instant reference to a world of information, possible. If forced to, I can still type an article on the typewriter. But the nature of thinking and forming sentences, the layering of a story, the ability to correct and revise on the go – all that will be different. Experientially, a journalist of the typewriter age is different from one of the Internet age. Experientially, today’s sailor working from sail boats supported by electronic devices is different from a sailor of 1968, who had none of these devices for back-up. What makes the 2018 GGR doubly difficult is that while the participants of the original GGR could equip themselves with the technology of their time, many among those heading for the 2018 GGR will need to abandon comfort zones they got used to and acquaint themselves with boats bereft of high technology. Abhilash was born in 1979. He belongs to the generation in India that grew up with computers and Internet. During the 2012-2013 solo, nonstop circumnavigation he accomplished on the INSV Mhadei – the first by an Indian – he had onboard the modern sloop (built by Aquarius), access to Internet and email, electronic maps, GPS and satellite phone. These are either absent or strictly regulated and meant for use under specified circumstances, in the 2018 GGR. According to the race website, every participant will get a standard Race Pack that will include a stand-alone satellite tracking system which the skipper cannot see but will be used for web tracking updates; a two-way satellite short text paging unit that will connect to race headquarters for 100 character-reports twice daily and a sealed box with a portable GPS chart plotter for use only in emergency. Denied access to modern technology, Abhilash will estimate his position at sea with a sextant; use printed navigation charts to plot his passage and gauge the submarine features of his neighborhood and rely on VHF and HF radio transmitters to communicate. In fact, so total is the clamp down on technology that even devices with inbuilt GPS like digital cameras, mobile phones and electronic watches are disallowed onboard in the race. Managing with the recommended alternatives is easier said than done. Contemporary naval officers and sailors master the sextant during their training days. Thereafter it recedes to being an instrument you should know how to use; it isn’t what you use on an everyday basis for navigation, which is the stuff of computers and electronics. Abhilash, who is a naval aviator, will need to get used to the sextant again. And not just get used to it; he requires being good at it for it is all that stands between him and drifting off course in the world’s vast oceans. Further there is the question of which natural co-ordinates, usable with a sextant, the weather on a given day will allow sailor to see. Not to mention – don’t lose the sextant on small sail boat, no matter how harsh the sea. Speaking of which, no Internet onboard means no detailed weather reports from the outside world as well. Information on weather that is available as broadcast to mariners on HF and VHF radio will be the only reliable source. You can discuss weather conditions with passing vessels and fellow racers. But such meetings at sea are few on a circumnavigation route with much Southern Ocean involved. Getting weather from team managers will be unwise as it could be considered ` route-ing’ using information which is not generally available to the public. “ If the race management so decides they may give weather data to a specific boat, group of boats, or all boats. This would mostly be as a warning and not for improving performance,’’ Abhilash said. Challenges exist with the HF radio, the most easily comprehended of which is that unlike a telephone call that reaches intended person irrespective of where he / she is, radio communication is interactive only if both caller and receiver are available around their radio sets to connect. In planet of different time zones, this is not assured all the time. Similarly, the race has assigned a limit to how much fuel – for onboard engine – can be carried. The quest is to free up circumnavigation from its modern gadgetry, restore a touch of retro to it and make the ambiance match what the competitors of 1968 coped with. Doing so, you get a firsthand taste of what Sir Robin Knox Johnston and Bernard Moitessier accomplished. At the 2018 GGR, electronics are more with those overseeing the race from shore. The participants’ passage is monitored via satellite using these electronics. If things turn ugly and unmanageable at sea, Abhilash can open the sealed GPS onboard to determine his position. Doing so however, disqualifies him from the central category (the solo nonstop category) of the race. Onboard will also be a radio beacon; its activation indicating a given boat has most likely been abandoned. 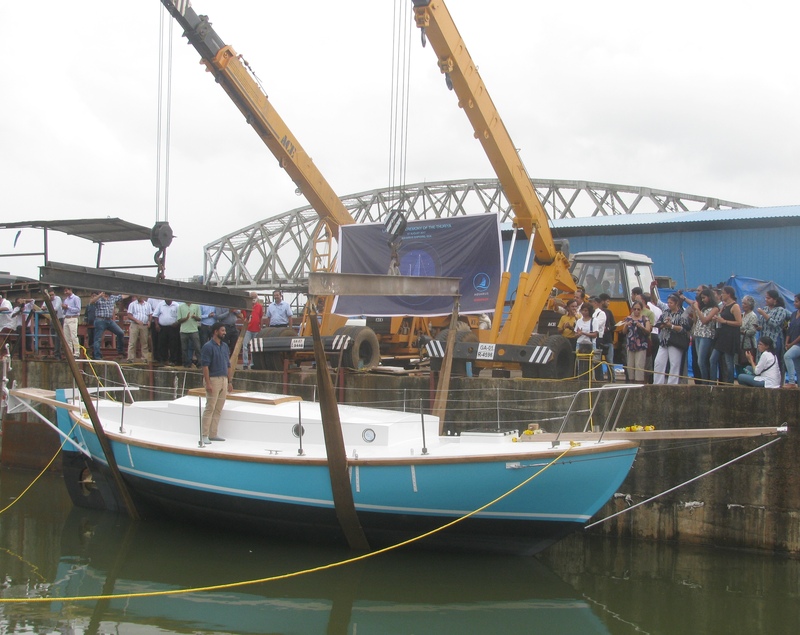 The evening of August 7, 2017, the Thuriya stood suspended by two cranes, inches above the Mandovi River’s water, let in at the drydock of Aquarius Shipyard. Every 15 minutes or so, a thundering sound – resembling that of an approaching helicopter – could be heard; it was the sound of trains passing by on the nearby bridge across the Mandovi. Aquarius is an unassuming yard predominantly making boats for the Indian military. It also caters to orders for boats from Indian state governments. 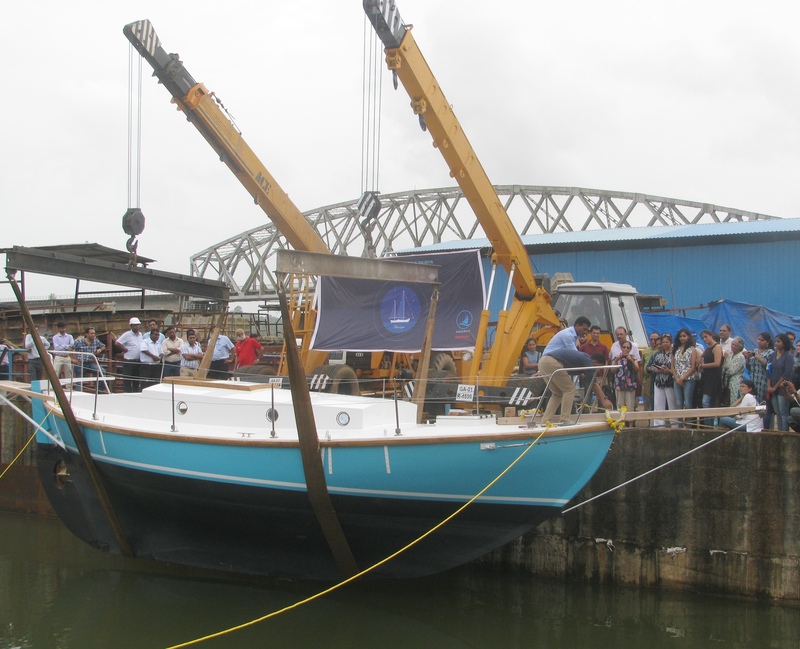 The yard shot into limelight building the Indian Navy’s iconic sail boat – INSV Mhadei. A sloop, based on a Dutch design, it took two naval officers around the world on two separate circumnavigation voyages. The first was Captain Dilip Donde (Retd), who executed the first solo circumnavigation by an Indian. The second was Abhilash, who accomplished the first solo nonstop circumnavigation by an Indian. There are few boats around that have done back to back circumnavigations plus trans-Atlantic races and other voyages, as the Mhadei did. It is a testimony of her build quality and the care with which, former skippers like Dilip and Abhilash treated her that she did both these circumnavigations without any major problems. Aquarius later built a second sail boat for the navy, INSV Tarini, which is identical to the Mhadei and as of August 2017, was expected to depart shortly on the first circumnavigation of the world by a crew of Indian women. Despite tendering process that rewards the lowest bidder, Aquarius took on construction of sail boats because it is a demanding task. While most of us get carried away by the speed and flight of motorized craft, they are generally more forgiving of error in design and construction because the brute power of the engine compensates for such shortcomings (unless the idea is to build for a specific purpose, like very high speed to set a record). Harnessing wind is a different ball game. Here design and build quality genuinely matter; room for error is less. 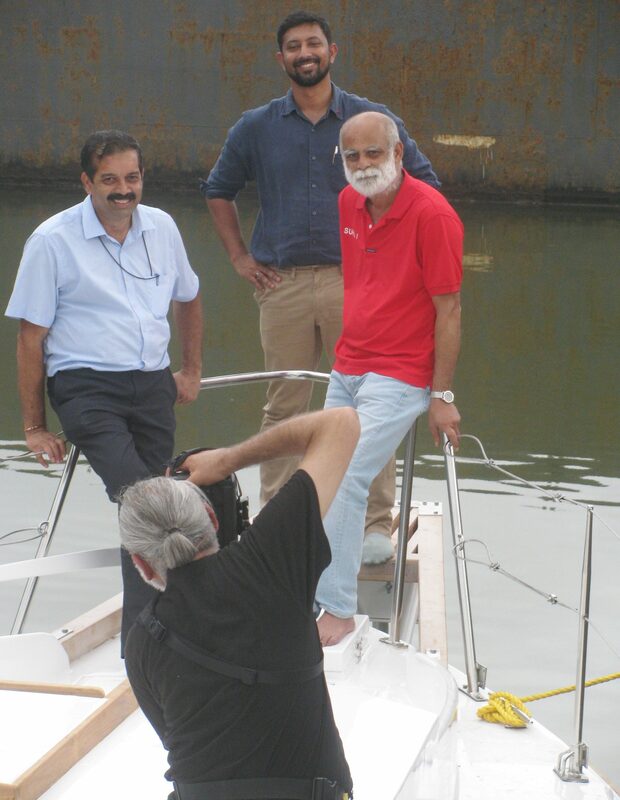 “ Making a sail boat is more challenging,’’ Ratnakar Dandekar, who owns Aquarius Shipyard, said. When it came to a boat for the 2018 GGR, Abhilash made three notable decisions. First, he decided to build the boat in India, at Aquarius. He knew the yard would do a good job. Besides, the earlier two circumnavigation voyages had ensured that he, Dilip and Ratnakar, became a fine team. They understand each other well. For boat to sail, the organizers of the 2018 GGR had provided participants a variety of designs to choose from. They included Westsail 32, Tradewind 35, Saga 34, Saltram 36, Vancouver 32 & 34, OE 32, Eric (sister ship to Suhaili), Aries 32, Baba 35, Biscay 36, Bowman 36, Cape Dory 36, Nicholson 32, MKX-XI, Rustler 36, Endurance 35, Gaia 36, Hans Christian 33T, Tashiba 36, Cabo Rico 34, Hinckley Pilot 35, Lello 34 and Gale Force 34. One suggestion Abhilash received was that he buy a secondhand Saltram 36 and refit it to the retro norms of the 2018 GGR. This design of boat – originally called Saltram Saga 36 and designed by Alan Pape – is a classic long-distance cruising yacht. It is double ended (the fore and aft taper in similar fashion) and sturdily built. However locating good secondhand boats of said design overseas and then refitting them is both time consuming and likely, expensive. If the refitting is to be done at Aquarius, the boat would have to be sailed in from abroad, refitted and sailed to UK for GGR. If the refitting is done overseas, you don’t get any of the cost advantages attached to work done in India. The next option was to go in for fresh construction. 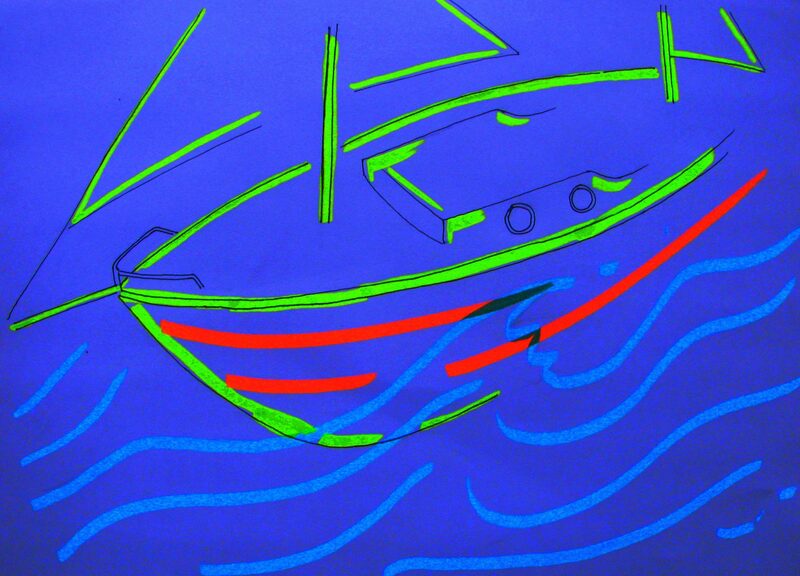 So for second major decision, Abhilash resolved that the boat he would sail in will be a replica of the Suhaili. “ It was the only boat I could build in India and I was keen to sail a boat built in India. I had a conversation with Don McIntyre from race management. He said that for any other design, the construction would have to happen from the original mould. The only leeway was for the Suhaili replica, which could be built, brand new,’’ Abhilash said. The Suhaili’s design is called Eric 32; it was drawn sometime in the 1920s by William Atkin. The third decision was more personal. Abhilash had always wanted to own a classic sail boat. Few boats in circumnavigation are more classic and steeped in the discipline’s history than the Suhaili. Abhilash decided that he would be the owner of the new boat. By Indian standards, owning a boat costs a lot of money. Ever helpful, Ratnakar started constructing the boat for Abhilash in 2016, using his own funds. As the boat neared completion, Abhilash liquidated some of his investments and partly repaid Ratnakar; the idea is to repay fully in time. At around 5.56 PM on August 7, the blessings of the Gods sought, the cranes gently lowered the Thuriya and she kissed water for the first time. All boat designs strike a compromise between stability and speed, depending on the purpose for which the boat is being acquired. 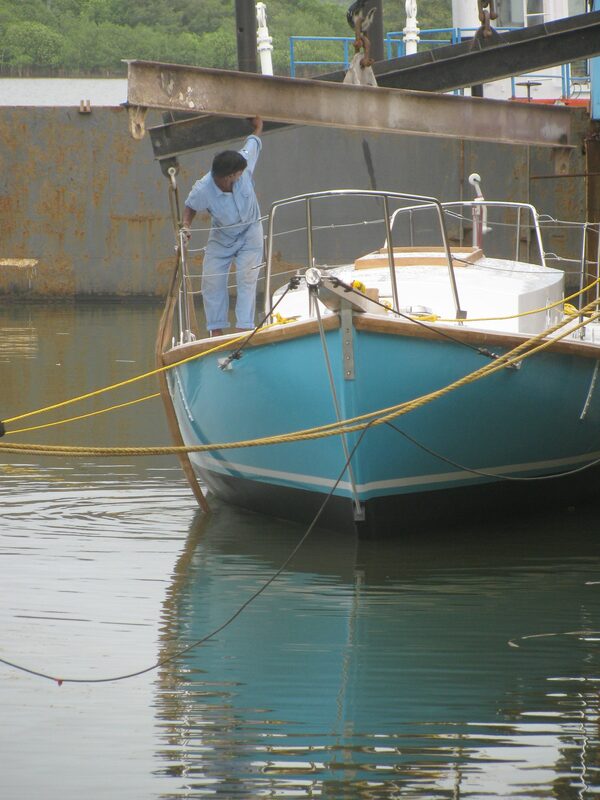 So far, the bulk of Abhilash’s sailing has been on the Mhadei, which is a sloop, based on a design called Tonga 56. The Mhadei offers stability but she also offers adequate cruising speed on long voyages. Her hull made of wood core laminate; she has one tall mast and two sails. To the lay person beholding her, she has the sleek lines of a modern yacht. Her cabin with angular windows, rise prominently from the deck. She is not double ended; her aft ends in an angled chop. She has a bulbous keel, laden with lead to act as counterweight in the event of capsize. “ The Mhadei is a big sail boat. She has lot of space within. If you load the boat, the percentage weight difference is less. Thanks to its high volume, it can ride down a wave at decent speed. Her upwind performance is also good. You can sail well into the wind,’’ Abhilash said. On the flip side, her sails are big and it is near impossible for a lone sailor to change the mainsail. Being a big boat, breakdowns are also tough to handle. The Thuriya is a ketch. Much smaller, her Eric 32 design is roughly half the length of the Mhadei and her cabin sits sunk into the deck, rendering the cabin’s external profile almost invisible from far. The smaller size of the Thuriya made her trickier to build, Ratnakar said. She will have shorter masts. But against the sloop’s single mast, the ketch has two and between them they offer three sails. This doesn’t mean the sail area is greater; what it means is that the ketch is capable of harnessing the wind more precisely for greater maneuverability. The Thuriya’s hull is double ended and visibly squat. This aspect of the Eric 32 relates directly to design inspired by Norwegian fishing boats and which Sir Robin consciously chose when it came to the Suhaili, for his priority in the 1968 GGR was a stable, safe boat. Speed is not the forte of Eric 32; the Suhaili is a slow boat, as would most likely be, the Thuriya. Unlike Mhadei, which has two steering wheels on deck, the Thuriya is steered using a tiller. “ I prefer a tiller over a wheel. You can sit and steer the boat. 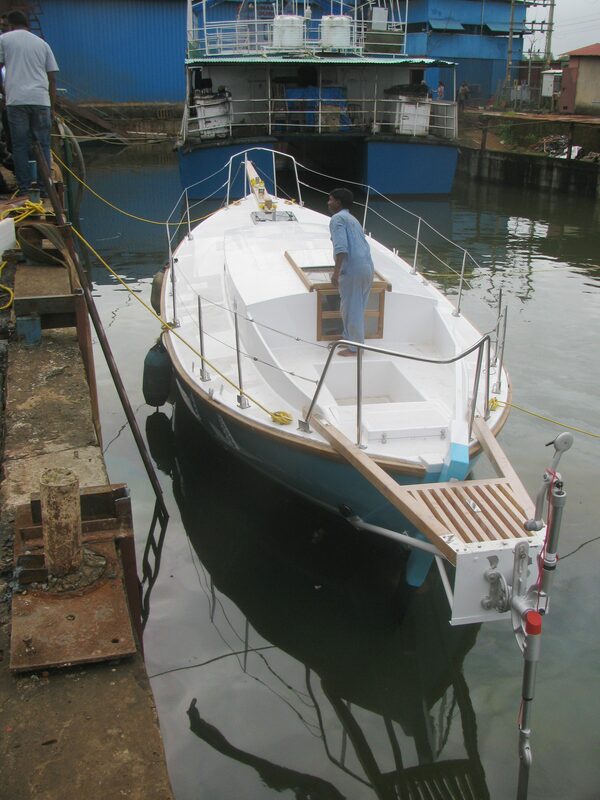 Besides the tiller’s connection with the rudder is direct, unlike in the case of a wheel, which entails gears and transmission,’’ Abhilash said. Compared to the Mhadei’s two electronic and one wind driver autopilots, the Thuriya has one wind driver autopilot, donated by its manufacturer: WindPilot. Below the waterline, the Thuriya has a relatively straight keel needing less draft. The boat’s overall dimension is perfect for solo sailor venturing long distance; it is a compact ecosystem with everything at hand. On the flip side, a small boat cannot take a lot of weight and when you load it, the boat tends to slow down. “ The slower the boat, the more you need to carry because your voyage becomes longer. That’s an equation I will need to manage,’’ Abhilash said. Measured for length, the Thuriya is smaller than a modern 40 foot-marine container. From the bridge of a big ship with sizable real estate of deck stretching before it, small boats are difficult to notice. In their writings, sailors on small boats have highlighted the David-Goliath relation they tackle at sea, in world of ever growing ship sizes. Not to mention, the hazard of cargos and containers floating around after they fell off unnoticed from ships. Asked if the small size of the Thuriya and her lack of electronics added that much more pressure on solo sailor maintaining a watch at sea, he said that for most part the 2018 GGR’s circumnavigation route is still devoid of busy traffic. “ For example in the voyage on Mhadei, after crossing Sri Lanka, the first ship I saw was two and a half months later at Cape Horn. The next was one and a half months later, off Mauritius,’’ he said. Watch-keeping (staying awake, alert and on the lookout) requirements go up in and around shipping lanes and one problem is – ships are no more serious with watches as they used to be. A special invitee for the 2018 GGR, Abhilash has rich experience in sailing and now, a boat. What he may be in short supply of is – time to get everything ready for the voyage. In the run up to his last circumnavigation, he had taken to living in the Mhadei to get used to the boat. Given shortage of time, it may not be possible to do that with the Thuriya. What he was certainly in short supply of at the time of writing this article was – sponsors. Between now (August 2017) and a month and half before commencement of the 2018 GGR, he needs to fit masts on the Thuriya (for which she has to first move past the low Panjim bridge to berths downstream from Divar), put her through her paces at sea, get a sense of her behavior, sort out teething problems, sail her to Cape Town on her first long voyage (and probably his, mimicking GGR norms), load her on a ship to the UK from South Africa and report as per schedule to the race organizers for formal introduction of boat and her skipper. Getting a sense of the Thuriya on the water is important for two reasons. First she is a ketch; there will be an element of transition to do from Abhilash’s previous experience on a sloop to handling a ketch. Second, the Thuriya is a replica of the Suhaili with one distinct difference. The Suhaili was made of teakwood. Repeating such construction in 2016-2017 would have been terribly expensive. The Thuriya is therefore made of wood core laminate, like the Mhadei. This makes her stronger and lighter. “ She could be a livelier boat,’’ Dilip, who will be the manager of Abhilash’s team for the 2018 GGR, said of the boat’s potential behavior on water. The use of wood core laminate for making a replica of the Suhaili is permitted by the race organizers. Going by the details available about participants on the race website, the most widely chosen design appeared to be Rustler 36, followed by Biscay 36, Endurance 35 and Lello 34. At one point in the run up to 2018 GGR, there were four Suhaili replicas planned, Abhilash said. As far as he knew, the Thuriya alone remains in the fray. Expeditions go retro in a quest to relive original purity. Such instances are rare. Success in one’s time by all means possible, using everything that minimizes error and possibility of setback, is the dominant character of adventure in our crowded, competitive times. In mountaineering, alpine style climbing is an attempt to be light on the environment and also feel the challenge closer. But climbers still use the latest gear. Once in a while, in a documentary film of climbers from the past with contemporary climbers enacting days gone by, one sees the retro touch fleetingly. You could argue free soloing is retro because climbers dispense with gear altogether. But that isn’t retro; it is more defying risk. A whole expedition in retro style – that would be very rare although the rising aversion for consumerism has begun triggering a return by humans to simpler times. And as the sextant would show, simpler times are not exactly simple; they entail much work. I asked Abhilash if there are any trends emergent in the world of sailing, to go retro. According to him, current trends are all towards more and more expensive sailing. People aspire for costlier boats and yachts. Races are also getting more expensive. It is the full on, jazzed up version that sells. That said, retro allows sailing to be less expensive. It is also more challenging and given that, it may remain a niche pursuit by the adventurers among us. The 2018 GGR has parameters to differentiate finishers and provide a semblance of winner. Besides the Golden Globe trophies, Golden Globe plaques and total prize money of 75,000 pounds for distribution, those finishing before 15.00 hours on April 22, 2019 will receive a Suhaili trophy and refund of their entry fee. Anyone making a single stopover or forced to break the seal on their portable GPS chart plotter can remain in the race but will be shifted to the `Chichester Class’ (named after Sir Francis Chichester, who in 1966-1967 in his ketch, the Gypsy Moth IV, became the first person to achieve a true solo circumnavigation of the globe from west to east, via the three great capes; he made one stop at Sydney). They will get Chichester trophies provided they finish within aforesaid deadline on April 22, 2019. Anyone making two stops will be disqualified. “ In 1968, only one person finished GGR and he was the winner. In a race like 2018 GGR, you are a winner if you finish,’’ Ratnakar said. This entry was posted in Outdoors / Travel, People, Sagar Parikrama, Sports. Bookmark the permalink.